I bought a Photoshop license in 2003 and have had one ever since. Whenever I use it I feel I’m shooting a pea out of a cannon, but I suppose I’ve learned a thing or two over the years. I saw Thor: Ragnarok. It was lots of fun, even if I could see some of the jokes coming a mile away. 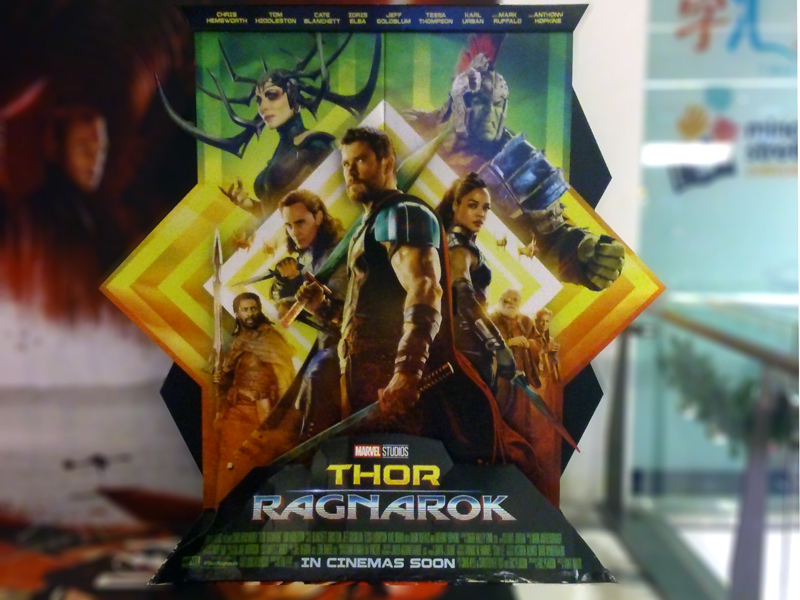 Thor: Ragnarok sign at We Cinemas at 321 Clementi. At first I thought Thor was holding a saw. But no. 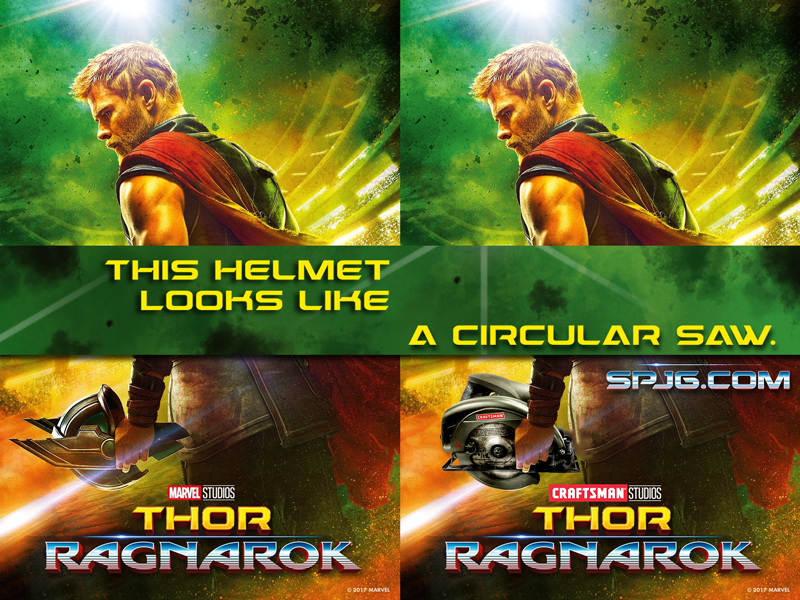 Actually, it’s a helmet. That makes much more sense. If you believe everything you read, you don’t read enough. Everyone is different. Thank goodness. If everyone were like me, English would be stuck with the subjunctive forever. Everyone is different. Thank goodness. Sometimes alternative words to songs just come to me. Look what happened to “I’m a little teapot”! Or else I’ll make you rue the day. 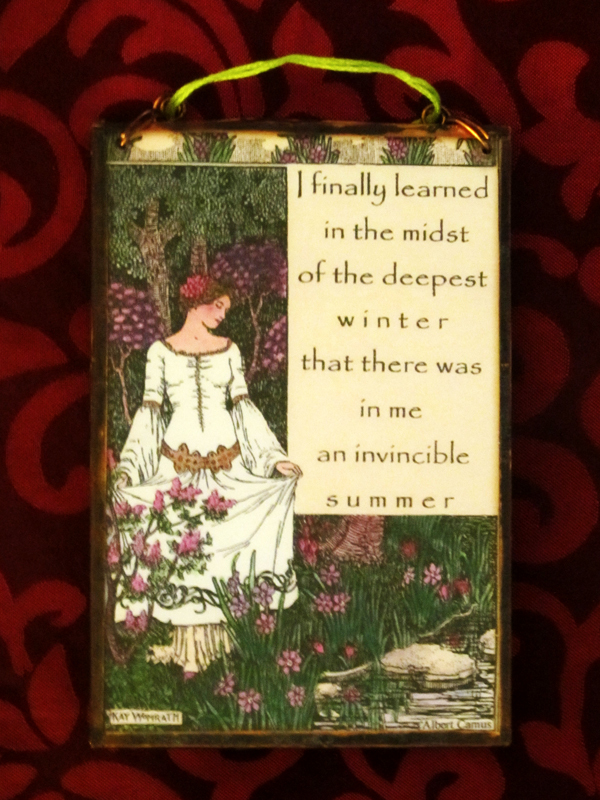 I finally learned in the midst of the deepest winter that there was in me an invincible summer. The plaque was made by Barbara Hinchey (who, it seems, in the time intervening has allowed to lapse her website www.barbarahinchey.com). The illustration says ‘Kay Womrath’ in the corner. (I’m really glad my family name isn’t Womrath, aren’t you?) 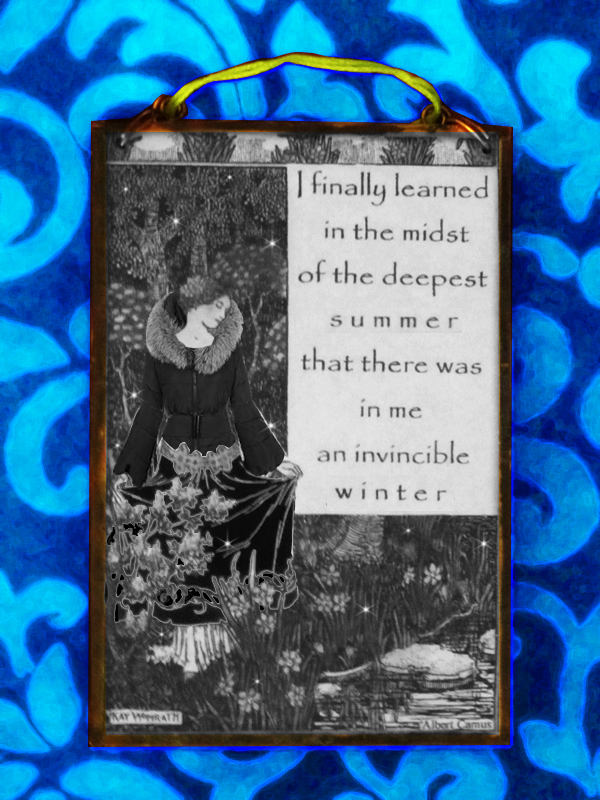 Google tells me the artist’s full name is Andrew Kay Womrath, and that the illustration was actually done for a poem by Keats, which some enterprising soul on Zazzle will sell to you displayed on a variety of objects. But that is neither here nor there. I call your attention to this object because I am stuck—stuck, I tell you!—in the middle of the deepest summer. A summer of epic, George R.R. Martin proportions. Look, I’ve been in Singapore more than six years now, and it’s always summer here. Six years times three extra summers per year is, let’s see, eighteen extra summers. I don’t have to look in me for summer; it’s all around. What I have to seek within me is, in fact, any kind of winter that isn’t caused by air conditioning equipment. Or a carefully scheduled airplane journey lasting six or more hours. And so I give you a new version of the plaque, with apologies to Camus, Womrath, Hinchey, and anyone who is offended by the mere sight of the overused font called Papyrus or appalled by whatever meagre Photoshop skills I have managed to deploy. Even though at one point I came to believe that the original plaque was being a bit smug at me, I now believe I have had the last laugh. This is what creativity is for. Don’t like something? Change it. Can’t change it? Joke about it and move on. One might even say, let it go.